Today, Ben announced the final grants of the 2012-13 season from the Ben Roethlisberger Foundation at The Giving Back Fund. The Foundation will be distributing eight grants totaling $66,382.17 to police departments in the Pittsburgh area. The K-9 Departments receiving funding from Ben’s Foundation this year are the Borough of Kittanning, Center Township, City of Aliquippa, City of Clairton, Latrobe, Mt. Pleasant Borough, New Castle, and Robinson Township Police Departments. Funds will be used to start new K-9 units as well as maintain existing ones who will purchase additional K-9s, K-9 safety vests, training equipment, food and other necessary expenses of the K-9 units. 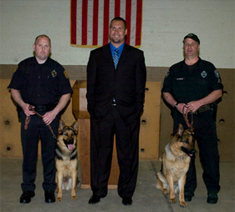 The Ben Roethlisberger Foundation is grateful for its generous supporters who have enabled it to expand its K-9 grant program, including Pro Camps and Allegheny County District Attorney’s Office as well as caring individual donors from around the country. The Allegheny County District Attorney’s Office has generously offered to match half of the grants awarded to departments in their county. This includes Robinson Township and City of Clairton Police Departments. This announcement completes the Foundation’s sixth grant cycle, during which it distributed more than $135,000 in grants to K-9 units around the country. In addition to the Pittsburgh grants announced, the Foundation distributed grants to police and fire departments in the cities and surrounding communities of each regular season away game for the Steelers in the 2012-13 season. The Ben Roethlisberger Foundation invited police and fire departments in the eight cities to submit proposals detailing their needs. Since 2007, the Ben’s Foundation has made 107 grants totaling more than $950,000 to 102 police and fire departments and five community youth organizations, including Ronald McDonald House Charities and the Make A Wish Foundation. These 102 canine grants have funded the purchase of more than 66 dogs, the training of more than 28 dogs and 50 handlers, safety equipment for more than of 52 dogs and training equipment for more than 31 dogs as well as food, vet services and housing for countless more. You can read more about Ben’s Foundation here! You can read an article about the grant to the Borough of Kittanning by Jonathan Weaver at The Kittanning Paper here.